Recently I had the opportunity to do a little (and I mean “little” in the most literal sense) Office add-in development. If you follow me on this blog or Twitter, you know that I work primarily in the Azure space. Building an Office add-in is certainly new to me, but I figured it would be kind of fun to learn about something new. This journey started as a result of a partner that I worked with who was having problems getting their add-in to load correctly in both Word Online and Word (on their desktop). Odd . . . right? It should work the same when hosted in both Office Online apps and Office. To get started, I did a little Binging (just sounds odd . . . but whatever) for Office add-in development. I wanted to start with “official” Microsoft documentation, so I ignored results from StackOverflow.com and blogs (wait . . what if it is my blog . . .this blog . 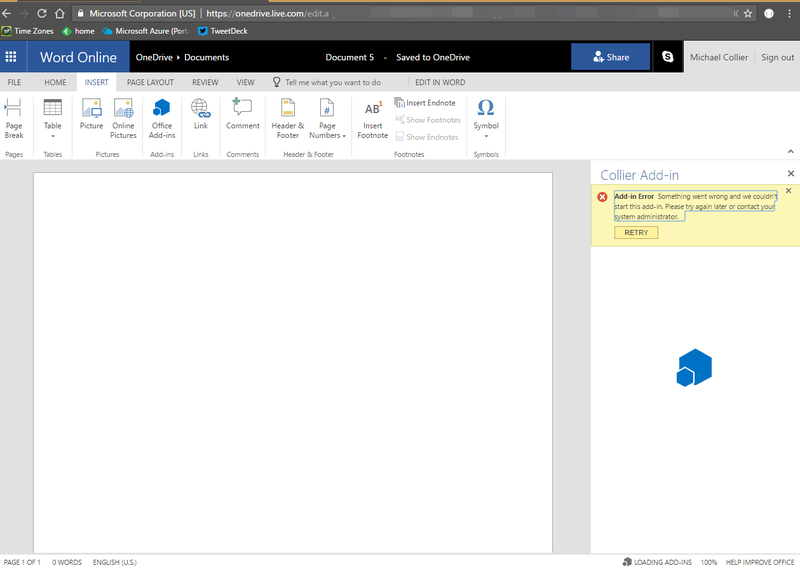 . .) One of the top results was the “Office Add-ins platform overview” page at https://dev.office.com/docs/add-ins/overview/office-add-ins. Sweeta! 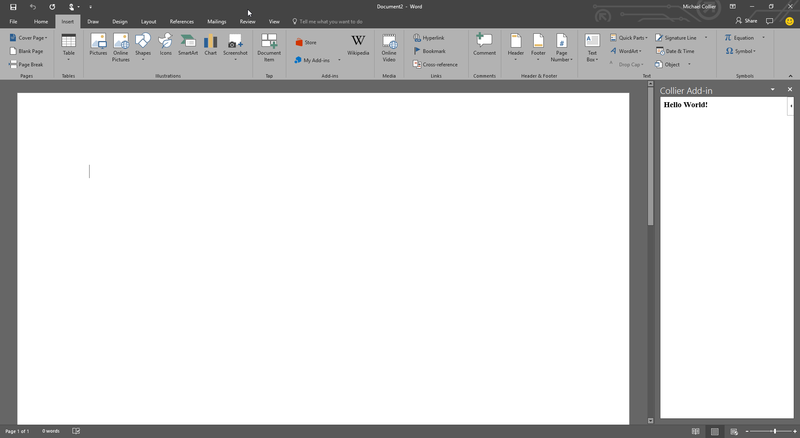 Finally, I get to something that looks like code . . .well at least a picture of code, at https://dev.office.com/docs/add-ins/overview/office-add-ins#anatomy-of-an-office-add-in. This section states that the minimal version of an add-in is a “static HTML page that is displayed inside an Office application, but doesn’t interact with either the Office document or any other Internet resource.” I can do that! I’ll simply write a “Hello World” app to just see it work, and then go from there. 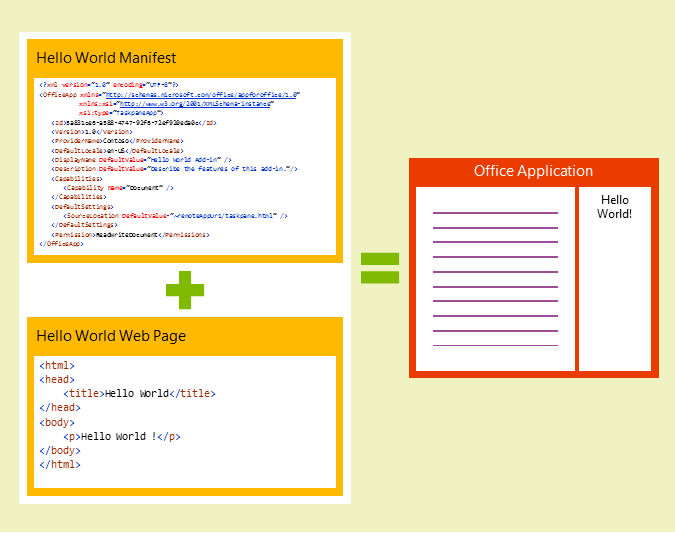 The page includes a picture of two components needed for a “Hello Word” Office add-in, the manifest file and the web page. Bam! I created the most basic HTML page . . . which just happened to look exactly like the one in the picture. I then proceeded to read up on how to debug the add-in via sideloading the add-in via Office and Office Online. This is easy! I started by sideloading the add-in via Word (desktop). Hot damn . . . it worked!! I then decided to push my luck and try it on Office Online. FAIL! Ok . . . so hit the “RETRY” button? Wait for the spinny icon to go away . . . . FAIL, again! Ok . . . . um. . . . WTF? Hit “START”? Sure . . what’s the worst that could happen? It worked!! This is where, as a developer, I start to question my life choices. I also realize there must be something else going on causing this funkiness. I tried the normal browser rotation game – Chrome, Edge, IE – all produced the same results. Hmmmm. YES! YES!! That would have been good information a few hours ago . . . . as on that “Hello World” page with the simple HTML example code. Put some big, red blinky arrows around this, for Pete’s sake! 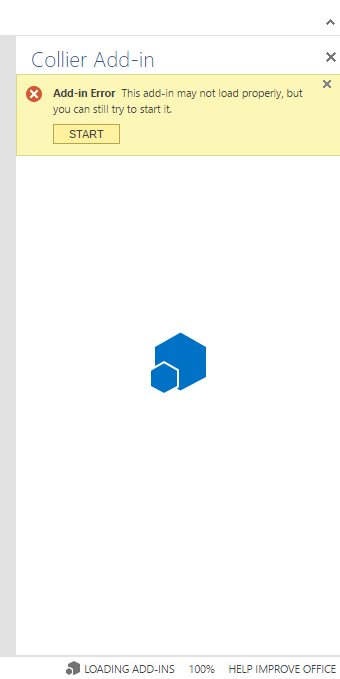 I proceeded to add the most basic office.js initialization code to my sample “Hello World” page (which just happens to be hosted on Azure Web Apps, with a local Git continuous deployment option . . . see, I had to get Azure in here somewhere). That’s a lovely story . . .what’s the point? If the documentation example seems too simple to be true, it probably is? Eh . . . sometimes. 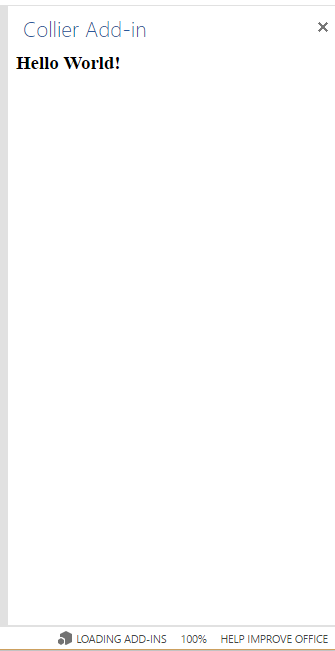 The point here is that for Office add-ins, you are absolutely required to reference office.js and at least set up an empty initialization block. Doing so helps Office in setting up some of the logical infrastructure needed for the add-in environment. It’s like magic. Only magic isn’t real. Mostly.